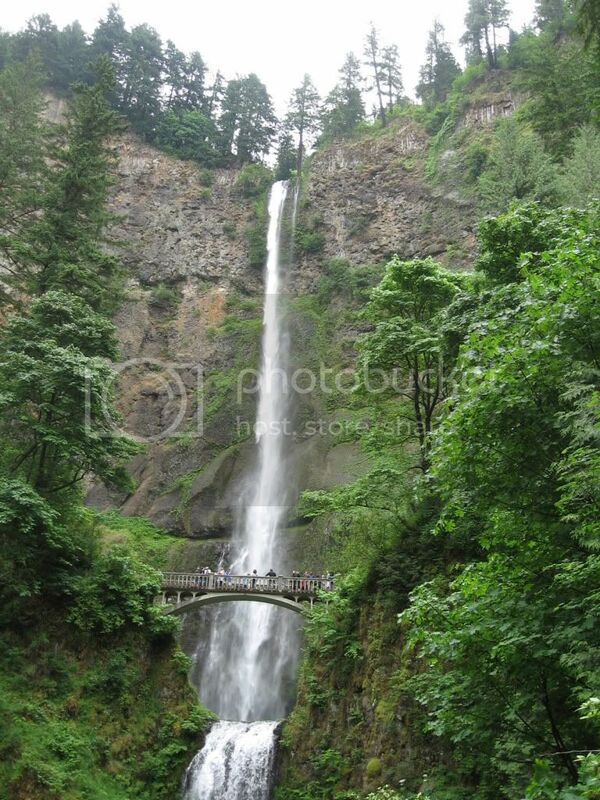 Multnomah Falls, east of Portland. ...but bicycles and dogs are the real order of the day in Portland. 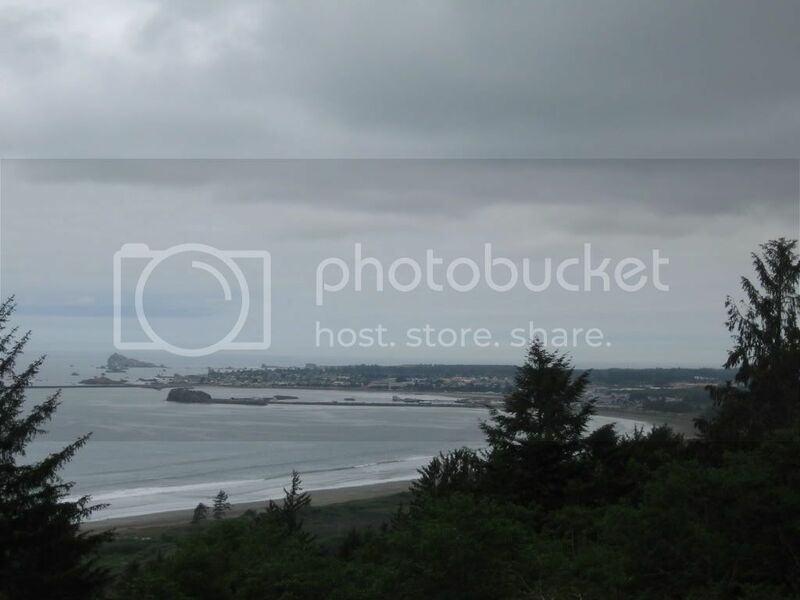 I took a few pictures of Eureka and Humboldt Bay before rolling out. I made a few more stops in the Redwoods; I didn't expect to have many once I got back to Interstate 5. Not long after leaving US 101 for US 199, I had to take an unexpected but important stop. Thanks to the unusually warm conditions the night before, I slept even worse than normal. This led to a retread of conditions from the Navy era - that is to say, I started nodding off at the wheel. On this particular stretch of pavement, it was even more important that I be fully alert, so I pulled off at a turnout and napped for forty-five minutes. It was the right call, and it was followed by probably the longest run of uninterrupted driving of the trip, at just over three hours. After dinner, I encountered the first rain in nine days (since Western Colorado). This was fickle rain too - it would come down for ten minutes and then stop, only to restart a few minutes later. I reached my brother's place in Portland at about 8:30...but he wasn't home. Not wanting to disturb him, I drove across the city to Wal-Mart to get some stuff. When I returned, he was there, and we spent two hours catching up before bed. The next day was spent simply touring around the area - thankfully, in my brother's car. Our first stop was the giant Intel plant where he works, and we also passed by Nike's world headquarters. We checked out the Rose Garden and Multnomah Falls, before having lunch at Five Guys in Beaverton. I'd heard of this place many times before; there's one in Mystic, Connecticut. But I'd avoided them previously, because I heard their burgers were quite greasy. The food I had on this afternoon was the opposite, and was in fact quite tasty. After lunch we headed out to Cannon Beach. There, we spotted a Range Rover with a Lebanese license plate...a bit surprising. After some communication problems, we were able to connect with some of Frank's friends, who cooked dinner. The chicken was quite good, and made even better by the fifth (and ultimately last) game of the NBA Finals on television. The night was capped by gelato, a kind of Italian ice-cream confection. Before we got it, Frank said "you know what they don't have out here that I like?" I knew exactly what the answer was - "Italian ice." I enjoyed the chocolate gelato...it was a nice end to a relaxing day that was much needed prior to facing what lay ahead over the next several days.